We recently had a customer that was transitioning from traditional desktop telephony to a Unified Communications solution. They came to us requesting a complete new range of USB headsets. 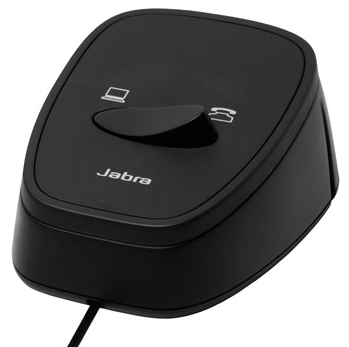 We suggested that a far more cost effective solution would be a simple but effective switch – the Jabra Link 180. The Jabra Link 180 enabled them to answer their desktop phone and softphone whilst keeping the same headsets that they had before. While the transition between deskphones to softphones was happening, the Link 180 allowed them to use one headset for both solutions. This ensured that they maximised their return on investment and didn’t need to replace their entire headset estate. Other clients have found the Link 180 useful for accessing on-line training material or webinars so do call us if you have a UC or on-line application that you would like to discuss.